An exhibition focusing on the third and final of the original Isle of Wight Festivals held at Afton in 1970 within sight and sound of Dimbola and which saw Jimi Hendrix’s last major performance and his last in the UK. The display includes rare posters and photographs of these legendary festivals. 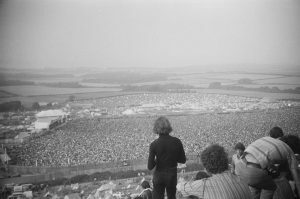 One photograph in particular is a panorama from Afton Down which gives an idea of the audience of 600,000 who gathered to watch Jimi Hendrix, The Doors, Taste, Miles Davis and Joni Mitchell to name a few. To compliment this there is a display of posters and images of the new IOW Festivals, revived by the leading music agency Solo in 2002, which have featured such artists as The Rolling Stones, David Bowie, REM and Paul McCartney. Also showing: Chris Cudlip bronze head of Hendrix. Chris has a background in special effects working as a freelance figurative sculptor and prop maker in London working for companies as varied as English national Opera, Madame Tussauds and Pinewood Studios He is now pursuing a solo career from the Arches Studios complex based in Southampton where he available for public or private commissions of any size. Outside Dimbola there is a small memorial garden with a statue of Jimi Hendrix designed by sculptor John Swindells. Have your picture taken next to Jimi and his guitar or breathe in the wonderful lavender ‘Purple Haze’ that grows in his garden (spring/summer) and enjoy the views down to Freshwater Bay.